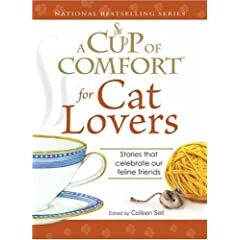 I received my copy of Cup of Comfort for Cat Lovers a day or two or three ago, wherein an old story of mine -- "Silky and the Woman Whose Hair Smelled Nice" -- is the featured essay opening the book. Silky, were she still with us, would be 19 years old this fall. We are presently cat-less, and I suspect we'll remain so until Belinda spots a kitten and says "Oh, how cute!" I remember that essay, Gary. Congratulations! Nice that Silky and Brenda should be appreciated again.